As the global freshwater deficit grows, a survey of 1,000 “environmental experts” from 77 nations asked why. Was it climate change, pollution, allocation, or rising demand? Predictably, 79 percent implicated the primary culprit as deforestation. The roots of that blame are broad, deep, strong, and old. 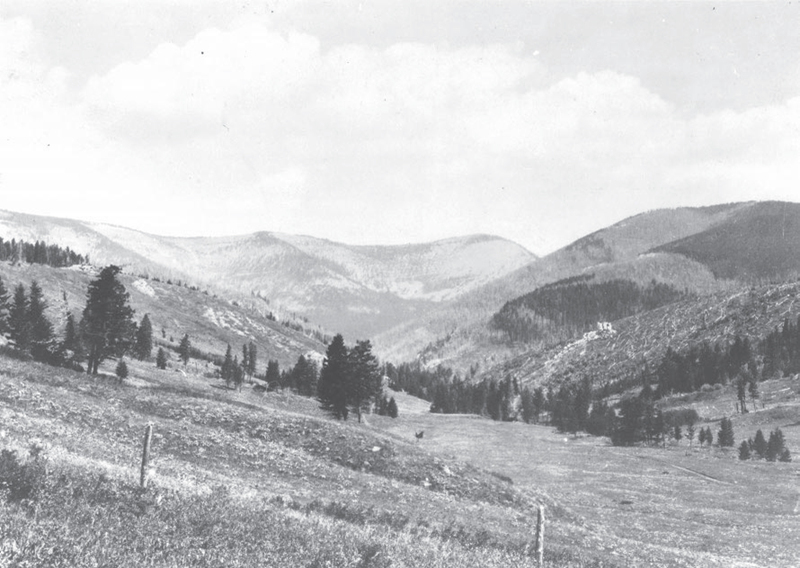 A century ago, Congress founded the USFS on the national security rationale that federal protection of forest reserves would maintain the stability of the navigable rivers they fed. Over ensuing decades countries followed suit, assuming reliable currents downstream always depend on dense forests upstream. The forest-water linkage now shapes widespread global efforts to secure flows with large-scale afforestation of headwaters of at-risk river basins for the worthy goal of human development, resilience, climate mitigation and adaptation. Given such high stakes, it’s worth asking: does our universal mindset linking afforestation with basin health actually, well, hold water? The evidence points in the opposite direction. Indeed, the comfortable notion that more trees invariably results in more water, stability, livelihoods, clean air, or biodiversity has begun to look misguided at best and, at worse, catastrophic. Rather than replenish downstream runoff, aquifers, wetlands and streams, aggressive afforestation tends to dry them out and clog them up. Worldwide, most experiments indicate that rapid and aggressive afforestation and reforestation “has resulted in lower water tables, less reliable springs, and reduced streamflow, especially in the dry season.” Much of the global South lacks data. But in America the mounting body of scientific literature on the effects of land clearing on forest hydrology suggests conventional wisdom is profoundly wrong, yet tenacious in its grip. Nowhere else are trees so highly regarded as a shade-creating panacea to pressing problems than in the U.S. Nowhere else honors tree planting as a sacred 150-year-old national holiday. Nowhere else is the afforestation-secures-runoff ethic so deeply entrenched and rigidly enforced. And nowhere else have flawed assumptions proven so ecologically destructive, economically disastrous, socially disruptive, medically harmful, or politically reckless. As California Governor, Reagan once justified clear-cut logging of old growth by asking (we assume rhetorically), “a tree is a tree; how many more do you need to look at?” Later, while running for President, he warned us how “trees cause more pollution than automobiles.” We cringed at his biases and snickered at his willful ignorance. Yet due to forces he neither intended nor foresaw, Reagan’s “gaffes” to some extent ring true. Why? Because today’s hottest and thirstiest parts of America are over-forested due to a vigorous and expensive federal fire-suppression initiative that has silently stocked semiarid regions with what we estimate to be several billion trees too many. Regular and cooler seven-year fire regimes that pruned back new growth have been blocked for decades on end. Now the relentless metastasizing spread of native, excess trees reduces sap flow, slows down wind-flow, and alters the complex biophysical structure of entire landscape. It crowds out indigenous plant and animal habitat. Shade tolerant species take over; Aspen, lupine, sequoia, and fireweed can’t reproduce. Less appreciated – both as crisis and opportunity – is how the afforestation caused by a century of fire suppression depletes a natural resource that has today become far more precious than toilet paper: fresh water. More than half of humanity is urban. Our freshwater shortfall comes from population growth, waste, pollution, rising demand for water-intensive goods – but also parasitic competition from unnatural afforestation. Of the 39 states facing water scarcity, few feel stress more than those West of the 98th Meridian; thirsty ‘cities in the wilderness’ – from Spokane to El Paso, Bozeman to San Diego, Salt Lake City to Tucson – depend on forest lands where rain and snowfall, filter through soil to supply water. Now, as billions of excess conifers drink up tributaries of the Colorado, Columbia, Missouri, and Rio Grande, we’ve turned trees from friends into enemies. Over the last century we turned trees from green friends we hug into thirst-stressed enemies we compete with for resources. But this ecological blowback didn’t happen by accident, overnight. Water depletion from afforestation is the unintended consequence of our deliberate 20th century federal lands policy. For millennia, fires set by lightning or by Native Americans limited Western forest stocks to roughly a few dozen trees per acre. No longer. The nationally terrifying Big Blowup wildfires of August 1910 led the US to in effect declare war on wildfire. The parallels with more recent wars on abstract nouns are eerie. The government’s tactics in both theaters include: security watchtowers, propaganda, aerial bombing and color-coded threat security alerts; ground troops carry tattered paperbacks of Sun Tzu’s The Art of War; bosses push for the deployment of drones; trained elite crews infiltrate behind enemy lines to snuff out nascent cells; Congress annually writes an emergency blank check, which in wildfire exceeds $2.5 billion. The result? More new trees compete for less sunlight, thinner soil nutrients and scarcer water resources. Insects and diseases spread faster. 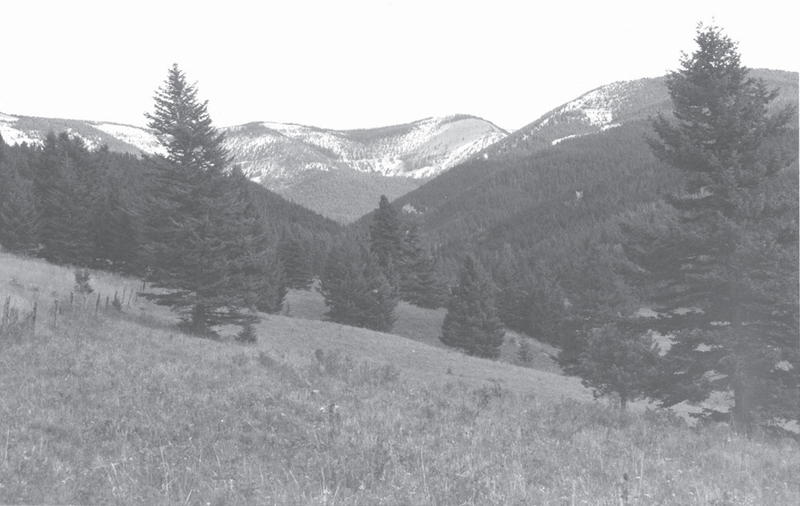 Unnatural afforestation creates a deadly tinderbox; fuels accumulate year after year until the inevitable wildfires burn faster, hotter, more destructive and deadlier than ever, consuming the treasure of citizens and the blood of our youth – from Montana’s Mann Gulch (1949) to Colorado’s Storm King Mountain (1994) to Arizona’s Yarnell Hill (2013). Ironically, Congress enacted the anti-fire 1911 Weeks Act and 1924 Clarke-McNary Act to save money, lives and secure downstream navigable rivers. That era’s national security precaution reflects Eastern US mentality. It backfired in the semiarid Western US, where fire exclusion degraded the integrity and runoff of high-elevation watershed recharge zones. Our analysis of upland research reveals downstream casualties. Suppression of fire causes suppression of flows, until you literally can’t see the river for the trees. Yes, the dynamics are complex. Sure, it’s dangerous to overgeneralize. The extent of hydrological impacts from fire-exclusion and afforestation will fluctuate dramatically by location, depending on forest slope, aspect, age, altitude, density, latitude, species composition and natural history. But adjusting for these variables, and taking a conservative approach, we can reveal the overarching pattern of the last century. 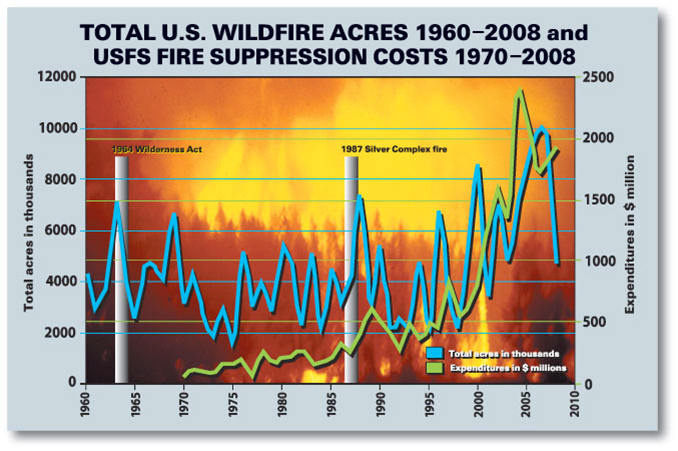 First, the past century of fire suppression has resulted in roughly 112 to 172 more trees per acre in high-elevation forests of the West. That’s more than a fivefold increase from the pre-settlement era. Second, denser growth means that the thicker canopy of needles will intercept more rain and snow, returning to the sky as vapor 20% to 30% of the moisture that had formerly soaked into the forest floor and fed tributaries as liquid. But let’s conservatively ignore potential vapor losses from ablation. Instead, assume that the lowest average daily sap flow rate is 70 liters per tree for an open forest acre of 112 new young trees. Even then, this over-forested acre transpires an additional 2.3 acre-feet of water per year, enough to meet the needs of four families. Third, that pattern adds up. Applying low-end estimates to the more than 7.5 million acres of Sierra Nevada conifer forests suggests the water-fire nexus causes excess daily net water loss of 58 billion liters. So each year, post-fire afforestation means 17 million acre-feet of water may no longer seep in or trickle down from the Sierra to thirsty families, firms, farms or endangered fisheries. Our estimates are on the low end. Yet they align with equally conservative assessments, based on concurrent, parallel literature reviews using different methodology. Some estimate that “in the Sierra Nevada, treatments that would reduce forest cover by 40 percent of maximum levels across a watershed could increase water yields by about 9 percent,” and suggest that “more sustained and extensive treatments in these increasingly dense forests could increase water yield by up to 16 percent.” They also accord with studies of overseas semi-arid landscapes that increase yield through forest thinning. Encouragingly, the USFS appears prepared to consider replacing our old, flawed, afforestation-boosts-streamflow mindset with the recognition that forests now and always have consumed water,xxiii and that growing threats from fire to insect outbreaks are linked to the water stress of over-forestation. So how do we reverse all this? A century’s accumulation of dry fuel in public lands makes it too costly and risky — for people, property, habitats or emissions — to unleash prescribed fires throughout our 16-million-acre conifer tinderbox. The whine of chainsaws may generate suspicion on the left, while conservatives may object to billion-dollar public works projects. Yet a third way could aid both anemic economies and anemic rivers: surgically remove the bulk of small-diameter ‘trash trees’ through careful, transparent, contractual thinning. Who pays? Now that a lumber mill’s trash has become a water user’s treasure, parched downstream interests could organize to restrict thinning to scrawny excess trees simply for the purpose of releasing the liquid assets they consume. Cameras can monitor every cut. Water rights markets value an acre-foot at $450 to $650 and up. So rather than compete with forests for rain and snow, private and public institutions could invest $1,000 per acre (average U.S. F.S price) to cut down fire-prone trash trees, yielding at least $1,100 to $1,500 worth of vital water. This contractual approach – anchored by Western cities –pays for itself while reducing fire risk, slashing carbon emissions, increasing water runoff to streams and rivers, raising revenues, and boosting job growth in poor regions. What’s not to like? There is no need for Federal or State funds or new laws; state and federal regulators could cut the red tape that might hold up local agreements between cities and rural areas that could restore forest health and replenish shrunken rivers. Regional precedents in the forest-to-faucet agreements emerge from Denver to Raleigh, N.C.
Our cultural mind-set may presume that if a dozen trees are good, 100 trees are better. But as temperatures rise, too much forest strangles too many watersheds. In order to replenish streams before they suffocate, and de-fuel the tinderbox before it explodes, we must stop hugging trees, or Smokey Bear, and embrace forest dynamics as a whole. James G. Workman (2005 Fellow) is a leader in the design and execution of natural resource conservation markets for water, fisheries, forest and energy. He is author of Heart of Dryness: How the Last Bushmen Can Help Us Endure the Coming Age of Permanent Drought, which won the prestigious Rachel Carson Award for best book of the year from the Society of Environmental Journalists, and co-author with Amanda Leland of the forthcoming The Quiet Sea Change: How America’s Hunter Gatherers Are Transforming the Rules of the Wild. He has been a visiting professor at Whitman Colleague and Wesleyan University’s College of the Environment, and co-founded AquaJust, an online utility-based platform that unlocks equitable water markets for cities using the system that has sustained the Kalahari’s indigenous people for 30,000 years. He was a 2005 Kinship Conservation Fellow and current Kinship Faculty member. Contact: jamesgworkman@gmail.com. Helen Poulos is a forest ecologist and Postdoctoral Fellow at Wesleyan University’s College of the Environment. Her research focuses on examining how natural and anthropogenic disturbances influence forest ecosystem dynamics. Contact: hpoulos@wesleyan.edu. "Given such high stakes, it’s worth asking: does our universal mindset linking afforestation with basin health actually, well, hold water?"